There’s a heated debate about the impact of foreign H1B visa workers on U.S. wages. This week, the H1B visa program begins accepting applications for fiscal year 2018. On that occasion, we took a closer look at the H1B program and the impact on wages according to salaries on Glassdoor. Beginning in 1990, the H1B visa program allows 85,000 college-educated foreign workers to legally work in the U.S. each year. This is a small number compared to the overall workforce of approximately 160 million; for example, the economy added 2.2 million jobs in 2016 alone, 26 times the size of the entire H1B program. But despite its small size, the program is hotly debated, and many employers would like to see the annual number of H1B visas increased. Advocates of the H1B visa program argue that it helps U.S. companies cope with America’s shortage of skilled technology and other professional workers by allowing them to hire talent from abroad. Critics argue that the program is a source of “cheap” foreign labor that is exploited by employers and hurts jobs and wages for U.S. workers. This debate was recently fueled by a new study from the National Bureau of Economic Research that found an influx of H1B workers in the 1990s reduced wages for U.S. computer scientists by 2.6 to 5.1 percent. Although the study also found that wages for non-tech workers rose by 0.04 to 0.28 percent — and despite being based on 16-year-old data — it was widely reported in media as showing H1B visas hurt wages for American workers. What are the facts about H1B visa salaries in today’s labor market? Are these foreign workers really paid less than their American counterparts? To answer this, we looked at a large sample of salaries from H1B visa applications and compared them to similar U.S. salaries reported on Glassdoor. We looked at the most recent year available — federal fiscal year 2016 — and focused on 10 major U.S. cities, comparing pay for U.S. and foreign H1B workers for the same job titles. To compare salaries for H1B and U.S. workers, we used a sample of 58,025 salary offers listed on H1B visa applications for workers in 10 large U.S. cities in fiscal year 2016 from the U.S. Department of Labor. As a comparison group of U.S. workers, we pulled a sample of 101,728 full-time U.S. salaries reported on Glassdoor for a similar time period, in the same 10 cities. We then grouped both samples into similar types of jobs, and looked at roughly 100 jobs for which there was significant data (at least 100 salaries in both H1B and Glassdoor salary samples). We ran a simple regression of annual salary on controls for city and job title, along with a binary indicator equal to 0 if it was a U.S. salary on Glassdoor and 1 for a H1B visa salary. The estimated coefficient on the H1B visa indicator tells us the average difference in pay between U.S. and foreign workers after accounting for differences in the city and job they worked in. The table below shows our results. The coefficient on the “H1B Visa = 1” variable shows that foreign H1B salaries are 2.8 percent higher on average than comparable U.S. salaries — a statistically significant difference. Thus, there’s no evidence that H1B workers are paid any lower than comparable U.S. salaries — and, in fact, earn slightly more — once we carefully compare workers in the same jobs, in the same cities, during the same time period in fiscal year 2016. Note: *, **, and *** represent statistical significance at the 0.10, 0.05 and 0.01 levels, respectively. Robust standard errors are shown in parentheses. Source: Glassdoor Economic Research; U.S. Labor Department. Although H1B visa workers earn on average about 2.8 percent more than comparable U.S. workers, that’s not the case in every job. H1B workers earn more that U.S. workers in about half of the jobs we examined, but in many cases they earn less, while in others they earn about the same. 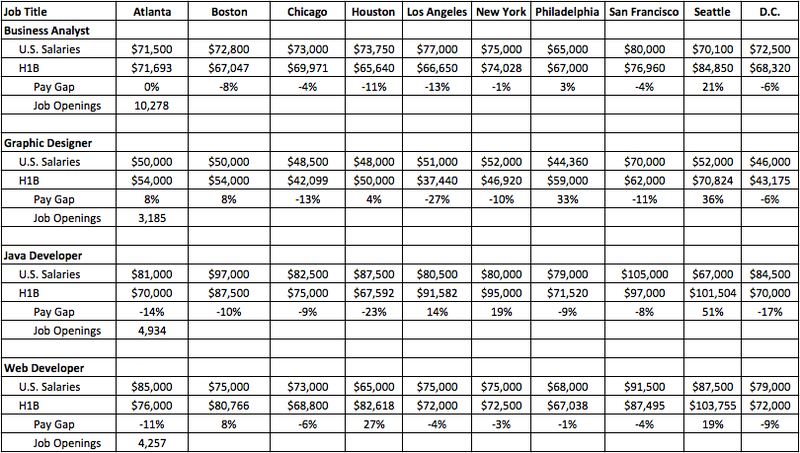 The table below shows four examples of jobs where H1B workers usually earn higher salaries than U.S. workers. 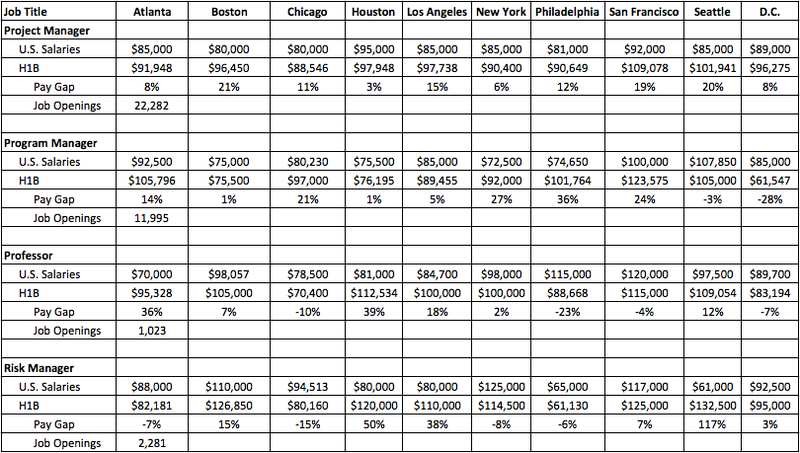 It shows the median base salary for each job and city we examined. Some jobs where H1B workers usually earn more than U.S. workers include: professor, program manager, project manager, and risk manager. For project manager roles, H1B workers earned higher median salaries than U.S. workers in every city we examined, ranging from 3 percent more in Houston to 21 percent more in Boston. That suggests most of these foreign workers are highly skilled and are filling in for acute labor shortages. Similarly, academic professors on H1B visas commonly earn higher pay than U.S. academics in most cities we examined, filling hard-to-fill roles at universities. For these jobs, it’s clear that H1B visas are not mainly a pool of low-cost labor — they’re usually more expensive than U.S. workers. Note: Job openings are active U.S. jobs on Glassdoor as of March 27, 2017. By contrast, there are many examples of jobs where H1B workers usually earn less than U.S. workers — despite legal requirements that employers pay “prevailing wages” to H1B workers. Four examples of these types of jobs are shown in the table below: data scientist, financial analyst, programmer analyst, and software engineer. In these cases, H1B workers usually earn less than otherwise similar U.S. workers. For example, among software engineers, H1B workers earned less than or equal to U.S. workers in every city we examined, ranging from equal median salaries in Seattle to -17 percent less in Chicago. 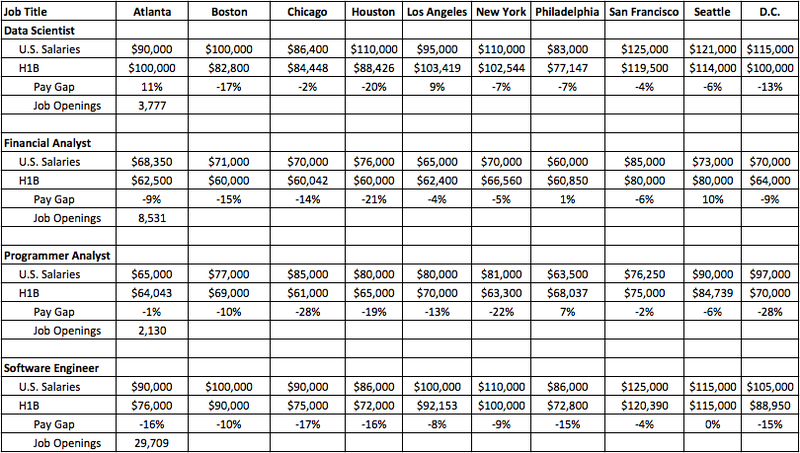 Similarly, H1B salaries for programmer analysts were lower in nine of the 10 cities we examined, ranging from -1 percent in Atlanta to -28 percent in Chicago and Washington, D.C. (H1B pay for programmer analysts was 7 percent higher in one city: Philadelphia). For these roles, the data suggest that the H1B program’s requirement that employers pay “prevailing wages” may not be working in practice as well as intended by U.S. immigration policy. Finally, there are many examples of jobs where U.S. and H1B workers are paid about the same. We show four examples in the table below: business analyst, graphic designer, java developer, and web developer. Although it varies by city, on average there isn’t much of a pay difference between H1B and U.S. workers for these roles. This suggests that the skill level for H1B and U.S. workers is closely matched for these roles, and that these H1B workers aren’t likely filling in for acute labor shortages. Why Aren’t H1B Workers Usually Paid Less? The finding that skilled foreign workers in the H1B program are usually paid about the same or slightly higher than U.S. workers for most roles shouldn’t come as a surprise, for several reasons. Another reason we shouldn’t be surprised that H1B workers are paid about the same as U.S. workers is because the law requires it. U.S. Department of Labor regulations require that employers pay H1B workers at or above the “prevailing wage” for similar jobs. Critics of the H1B program argue that employers game this system, intentionally understating the skill level of H1B workers to obtain lower prevailing wages. While that may be true in some cases — such as the example jobs we show above where H1B salaries are usually below U.S. salaries — the data show prevailing wage regulations seem to be working reasonably well in practice. Finally, there are good reasons in economic theory we should expect H1B visa salaries to be somewhat above U.S. salaries. H1B visa applications are expensive — a 2011 study from the General Accountability Office found that legal and administrative costs to employers for an H1B application ranged from $2,320 to $7,500 or more. Employers should only be willing to pay that extra cost if H1B workers somehow justify it with higher productivity or special skills not available among U.S. workers. If so, it’s not surprising that salaries for H1B workers who’ve cleared those costly regulatory hurdles are somewhat higher other workers who haven’t. The H1B visa program has been controversial since its beginnings more than 25 year ago with the Immigration Act of 1990. Although the program’s 85,000 visas per year are small compared to the U.S. labor market, it remains controversial because some fear that it hurts jobs and wages for U.S. workers. While the H1B visa program has a complicated impact on the labor market, in this analysis we look at one common misperception about the program: that it represents a source of “cheap” foreign labor for U.S. employers. To the contrary, we find that H1B workers today are paid slightly above similar U.S. workers in the same city and job according to Glassdoor data — about 2.8 percent more on average. Whatever the pros and cons of the program, low pay for H1B workers isn’t something we see in the data.